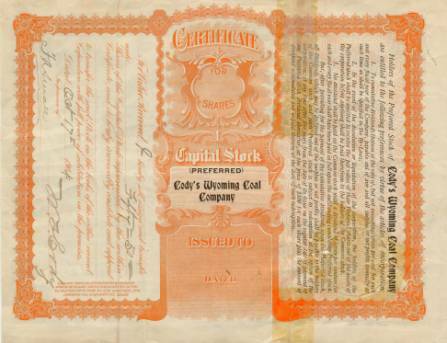 Beautifully engraved Scarce certificate #A11 from the Cody's Wyoming Coal Company issued on February 20th, 1904. This historic document has an ornate border around it with a vignette of an eagle. 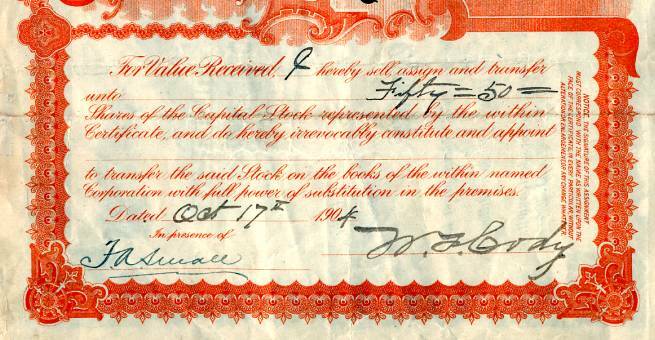 This item has been hand signed by Company’s President, William F. Cody and Secretary, John S. Bell. The certificate was issued to William F. Cody and signed by by him on the back. The certificate has been folded with minor signs of wear and is in fine condition. Tape repaired on back which doesn't affect the front. Both signatures are clean with no cancellation marks through them. William F. Cody was a Western scout and later a showman. For a short period following the Civil War he was employed by the food contractors for the Kansas Pacific Railroad construction camps to furnish them with buffalo meat - hence his famous nickname. From 1868-72 he did scout service for the army, eventually becoming Chief of Scouts for the 5th Cavalry. In 1872 he began his long career as a showman, forming the Wild West Show which bore his name. Cody had invested and supported several mining companies from the wealth he acquired from his Wild West Show. These investments turned out to be more of a financial quagmire than boom.